I actually know people who believe that one can have too many friends. I don’t. Granted, the word “friend” is used far too loosely. Most of the people that most of us call “friends” probably would be better described as “acquaintances.” Social network sites like MySpace and Facebook do much to muddy those waters. I, for one, am very picky about who I add as a “friend” on such sites. And, I don’t know many of even those people, as well as I’d like. But, to really have “too many friends?” I don’t think it’s possible! That was my introduction to Teri. I was, of course, rather floored, and incredibly flattered. How? Why? I wanted to know. 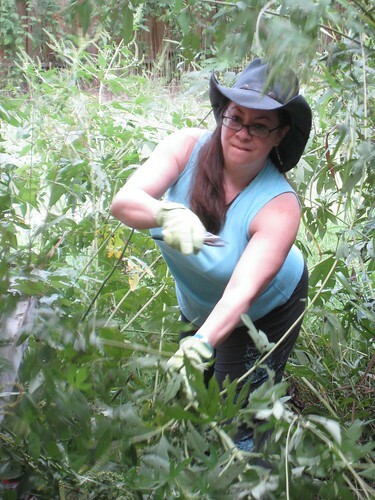 Her interests in faire and in costuming and sewing are the logical connection. We chatted for quite a while, and before she left Kyle came in and more conversation ensued, and photos happened. She told us she had followed intently, our travels in the UK this winter! And, she said even on the regular days we are entertaining to her. I was so surprised to think that somebody we had never met was following the KRuMB. 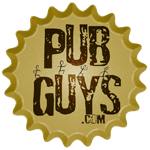 We know that we have friends (and acquaintances) who read the KRuMB and rarely, if ever, make a comment, and thereby stay pretty much under our radar. But, I hadn’t really stopped to consider that there might be people out there following our daily adventures, that we hadn’t even met, yet! It still actually rather boggles my mind. I write about my wife a lot saying "MB did this," or "my wife and I did that" or similar. But, there aren’t that many photos of her here. Mostly, I think, because she’s critical of her own appearance (aren’t most women?) and likely wouldn’t approve of most photos. However, this is the smiling face I go to sleep with every night and wake up to every morning. The woman of my dreams. I took a break from the shoppe today! My first time out of the booth during the faire day in three weeks. I had intended to walk the areas of the faire I hadn’t seen yet, this year, but instead, I spent a lot of my time at the nearest stage to our booth, watching Wine and Alchemy. Formerly E-Muzeki (with a different mix of members), the amount of enjoyment I got from this show was a surprise to me! Some dancing, some singing, lots of fun instrumentation, and perhaps the highlight—an incredibly talented male dancer! This guy completely commanded my attention when he danced. I was so impressed. It was another average day for us in sales, although up until the last sale of the day, I was a little worried. The crowd was very light—kept small by the weatherman who had foretold rain that never really came. We felt a few little drops at one point, but anything wetter must have happened somewhere else. But, at least the small crowd allowed me to see a show! Thanks, guys! We miss you! We celebrated a co-worker’s birthday this evening at Rob’s. I’d intended to rush straight home and get an early start on the drive; but the politic, the proper, the polite thing to do was…stop for a beer. Happy Birthday, Earl! Rod & Alyson were already at the house and had made peace with the puppies which enabled MB & I to begin the drive knowing that our little creatures would be in excellent hands for the weekend. We cannot possibly thank Alyson & Rod enough for their willingness & ability to house/dog/cat sit for a couple of days. Much love to them both. We arrived at TRF safely, unloaded the car, and started the going-to-bed dance…without a photo. 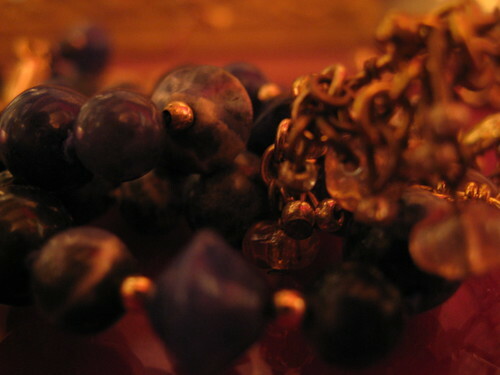 Luckily, MB had just deposited this necklace on a table, so I grabbed my camera and took the photo. Good thing, too, since I was sound asleep about 45 seconds later. I stalked a fairy today. And I caught her. Or perhaps I should say that she caught me. She certainly captured my attention. I was in the ladies restroom washing my hands, when this creature came in. I was duely impressed, and I think I may have told her so, as I watched her disappear into the largest stall. (Wings are a handicap, you know! Not unlike hoop skirts!) As I walked back across the lane, I realized I’d really like to have her picture. So, kept an eye over my shoulder for her to come out of the building, and I asked Donny if I could borrow his camera, since I am woefully without one right now. He quickly obliged, and I tripped back across the lane to wait for her to reappear. And waited. 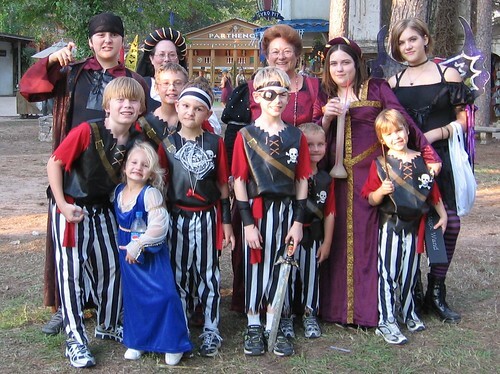 We see a lot of fairies at the Renaissance Festival. Who really knows why? 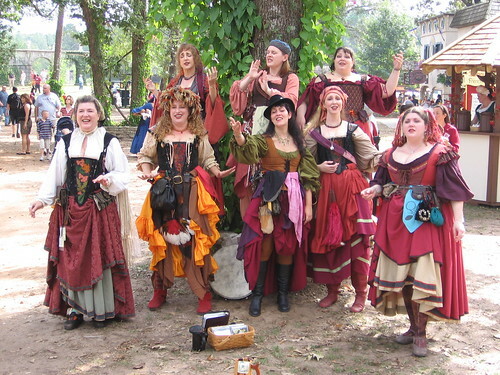 The fantasy element is undeniable at a renfaire, and certainly the costuming is less restrictive of movement and perhaps more comfortable . . . except for the wingspan, of course. 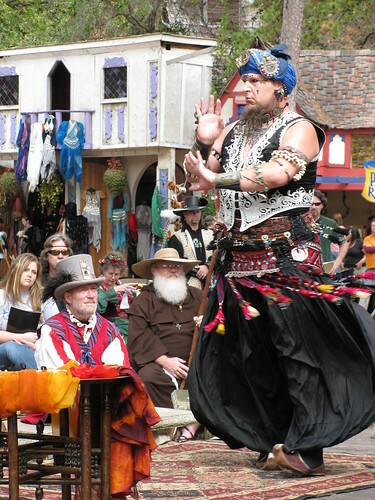 Some faires have even embraced the fantasy and included it in their performing company—Bristol Renaissance Faire does an extremely noteable job of this, with their “Fantasticals” and the way their other historical characters play with them. I’ve seen a woman in noble garb react to being tapped on the shoulder by a fairy, by “seeing nothing” and talking to the patrons around her about how if she didn’t know better she might be drawn back into the days of her youth when she still believed in fairies. Fun bit. Thanks, Donny, for the use of the camera! 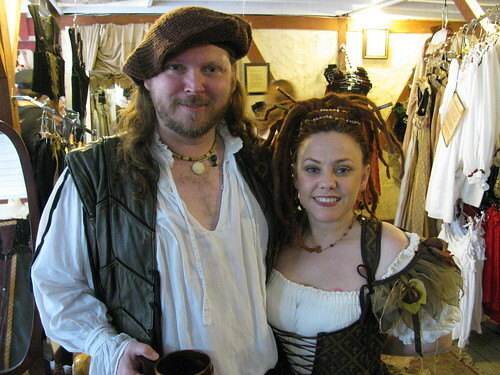 A couple of weeks ago, I wrote about the wonderful experience we’d had at the Pendragon Costumes booth at Texas Renaissance Festival, working with a couple who had come all the way from Germany to order our product. Two weeks later, after Nicole rushed to get part of their order done before they left the country, here are our new friends in their new finery! When they were done at our shoppe, Mary walked them to Guild of Toledo (an Excalibur Leather shoppe) for new boots and a hat for him. Perhaps she’ll link a photo of them after that shopping spree, when she sees this post!? 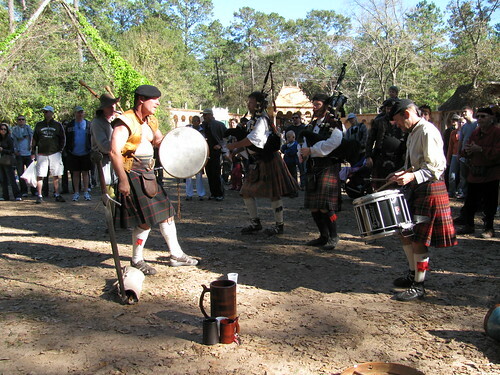 Another really beautiful day at the Texas Renaissance Festival. I cannot figure out why the crowds this weekend weren’t much bigger. It was perfect weather for being outdoors. But, sales were fairly average, so again—I feel I cannot complain. I told him it was because they all looked so great, and I thanked them for going to the effort to participate in the spirit of the faire. The ladies seemed grateful for the praise, and the boys were off down the lane. But, I got my photo, and although I don’t know anything else about who they are, I am charmed by it. I love the youthful energy it captures. I love the feeling of fun and adventure. 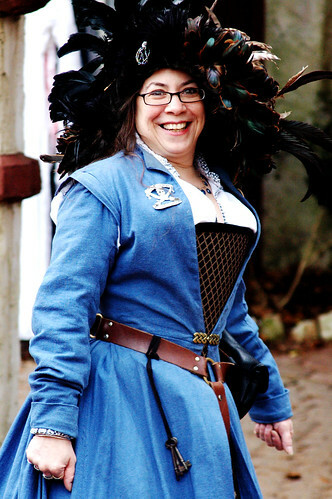 I am delighted anytime any patron has taken the time to play along and dress up to come to faire. No matter how many “packaged” pirates . . . no matter how many poorly-made Simplicity patterns . . . no matter how many “Witharrrrrds” in bathrobes and fake beards . . . I am happy to see them. That a patron takes the time, energy, money, and imagination to buy or make or borrow whatever his or her idea of a costume is, and then wear it, is a gift to those of us who need the faires to be successful. Without the people who have that sense of fun and participation, I wouldn’t have a job. Sunday of opening weekend was, of course, not as busy as Saturday. Kyle and I were both feeling better, and we even got to take a quick walk in the early part of the morning. We visited Kelly, at the secondary Excalibur shoppe, and we paid a visit to the new Merchant Prince Wine Bar—a lovely addition to the faire. 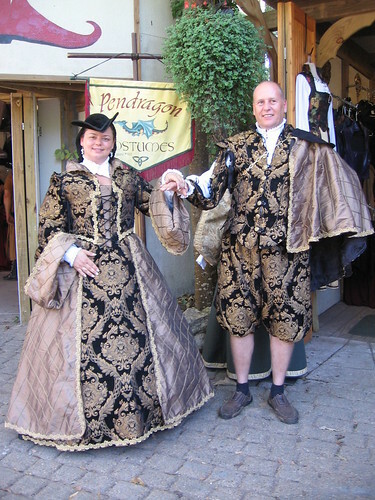 We had one really special experience, today—a couple who had travelled all the way from Germany to buy from us at Pendragon Costumes! They had planned their holiday to coincide with TRF’s opening, and came into our booth, with literally dozens of pages they had printed from Nicole’s website! I worked with them for nearly three hours, trying on garments, and dealing with a bit of a language barrier. But, we had so much fun! We have always been proud to be a part of Nicole’s business, but days like this really drive that home. We ended our Sunday with a trip to the Copper Rose—one of three restaurants in “Toon Town,” the rennie community adjacent to the TRF faire site. We each ordered something different, from burgers to meatball sandwiches to pork loin, and none of us were disappointed. It was a good wind-down from the weekend, and it didn’t take too long. I was back at my paperwork by about 11 p.m. and in bed by about one! Thankfully, the drive home will happen on Monday.